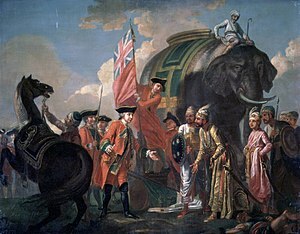 a Out of the initial 35,000 infantry and 15,000 cavalry, 45,000 of them were withheld by Mir Jafar, leaving 5,000 men to participate in the battle. A large stage, raised six feet from the ground, carrying besides the cannon, all the ammunition belonging to it, and the gunners themselves who managed the cannon, on the stage itself. 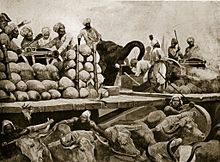 These machines were drawn by 40 or 50 yoke of white oxen, of the largest size, bred in the country of Purnea; and behind each cannon walked an elephant, trained to assist at difficult tugs, by shoving with his forehead against the hinder part of the carriage. ↑ अ आ इ Paul K. Davis (1999). 100 Decisive Battles: From Ancient Times to the Present, p. 240-244. Santa Barbara, California. ISBN 1-57607-075-1. चौधरी, एस. दि प्रिल्यूड टु एंपायर; पलाशी रिवॉल्यूशन ऑफ़ १७५७,, नई दिल्ली, २०००. सन 1757 की पलासी की लड़ाई – क्या हम जाहिल थे?